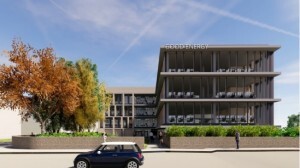 Renewable power firm Good Energy is to build a new sustainable headquarters that will enable it to continue to grow and recruit up to 100 more staff. The firm received planning consent from Wiltshire Council for the 31,748 sq ft building in Chippenham, pictured in a CGI, as well as a 255-space multi-storey car park with 40 electric car charging points. Good Energy, which has been based in Chippenham for the past 20 years, employs over 300 people in the town. It said the new HQ, which would be larger than its existing split-site head office on Monkton Hill, would enable it to increase its workforce in the town from around 300 to nearer 400. Construction on the new building, on a 1.77-acre site next to Chippenham railway station at Sadlers Mead – which is now a car park – will start this year and finish in 2020. 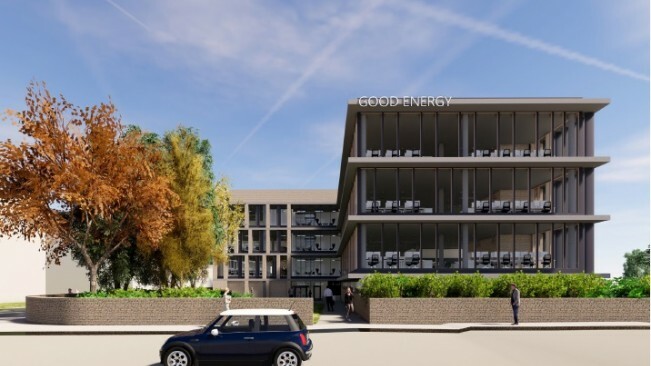 Good Energy said sustainability would be at the heart of the new headquarters with solar panels and battery storage as well as electric vehicle charging points. The firm said its current operations with employees based on two sites was not good for the workplace environment and was stifling growth. It said a key priority was to provide a workplace which “aligned with [its] sustainable values”, including being near the railway station to allow for green travel, and a better working environment for staff wellbeing. Good Energy director of people & culture Fran Woodward said: “This positive decision means we can commit to Chippenham for the long-term. The planned investment will allow us to grow as a company, while creating a modern and energy efficient building. Planning permission for the new HQ building came as Good Energy, which was founded in 1999 by Juliet Davenport, revealed a 132.6% increase in annual pre-tax profit to £1.7m on revenues up 11.9% to £116.9m in the year to December 31. The total volume of energy delivered to its customers grew by 3% to 1.09m MWh with business volumes up by 23.2%. Domestic volumes were down 1.2% in line with customer numbers. Juliet Davenport said: “A period of rapid change is underway in the UK energy market. The trends in both the competitive landscape and the continuing renewable energy revolution leave us extremely well-placed to succeed. She said this year would be important for the firm as it rolled out its SMART meter programme. “Technology is changing everyone's relationship with energy. People want to know how much they consume in their home and their business – how much they consume, and how much their home-generation equipment shares with the grid. Your home can become a miniature power station, with the right equipment in place,” she said. The growth of electric vehicles was bringing smart-grid technology to the fore, she added, pointing out that its recent investment in Zap-Map accelerated its presence in that market. “Good Energy will continue to focus on profitable, sustainable growth – led by supplying power to businesses, and supported by digital investments,” she said. Good Energy owns six solar sites and two wind farms – in Cornwall and Yorkshire – with a total of 47.5MW of installed capacity.